You will need a minimum of 25 hrs flying to gain your National Private Pilots License (NPPL), of which a minimum of 10 hrs have to be flown solo. During your training you will be required to fly 2 solo cross country flights, pass 5 written and 1 oral examination and finally pass a General Skills Test (GST). 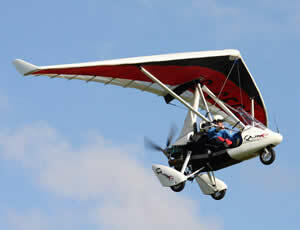 At Cheshire Microlight Centre we provide training on both fixed and flex wing microlight types; the choice is yours. 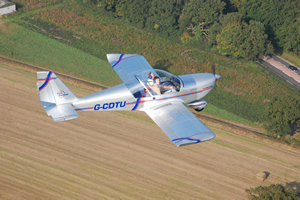 The flex-wing microlight is based on the principles of a hanglider style wing, controlled by the movement of the aircraft weight, known as “weight-shift”. A typical flexwing has an open cockpit trike unit configured with the passenger seated behind the pilot. The benefits of a flexwing are its simplicity and portability; also, relatively lower costs make it an all round “Fun” aircraft to fly. 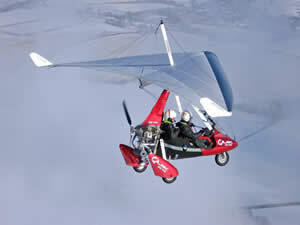 The fixed wing microlight resembles a conventional light aircraft in looks and control systems. Controlled by the movement of a stick/yoke and rudders, which move control surfaces on the aircraft wings and tail plane. In a typical fixed wing microlight the pilot and passenger sit side by side. Although fixed wing microlights tend to be more expensive than the flexwing alternative, typically they are less weather restricted and have slightly better performance. With dedication and favourable weather, it is possible to complete your flying and ground training in as little as 3 weeks. However, this requires an extremely high aptitude, and most students prefer to fly an hour at a time, spreading their training over 6 to 12 months. Ground schooling is normally arranged in groups, but private tuition is also available. All subjects are covered for the purpose of passing the written and oral examinations in Air Law, Navigation, Meteorology, Aeroplanes Technical and Human Performance. Many people consider microlighting a summer only activity. On the contrary, microlighting is an all year round sport, with some of the best flying done in the winter months when the air is free from thermic disturbance. Owning your own microlight and the ability to fly from a local farm field is the freedom of microlighting. The overall cost to purchase and operate a Microlight is similar to that of a small car or fast motor bike, but arguably far safer! Costs vary greatly; perhaps second hand allow at least £3,000 and £15,000 upwards for a new one. To obtain your licence from scratch, you should budget in the order of £3,000, normally spread over 6 to 12 months. But remember this may vary on individual aptitude. So for as little as £6,000 you could be the enviable owner of a private pilot’s licence and your own microlight aeroplane. We provide conversion lessons allowing existing microlight pilots to become competent in both flex and fixed wing types. The freedom, fun and low cost of microlighting attracts pilots with various GA and commercial licences wishing to take up the sport. If you already hold a licence and are interested in what microlighting has to offer, then contact us to book a trial flight or further discuss your interest in conversion training.